Submitted by zordren3742 on 2018-07-25 04:49. 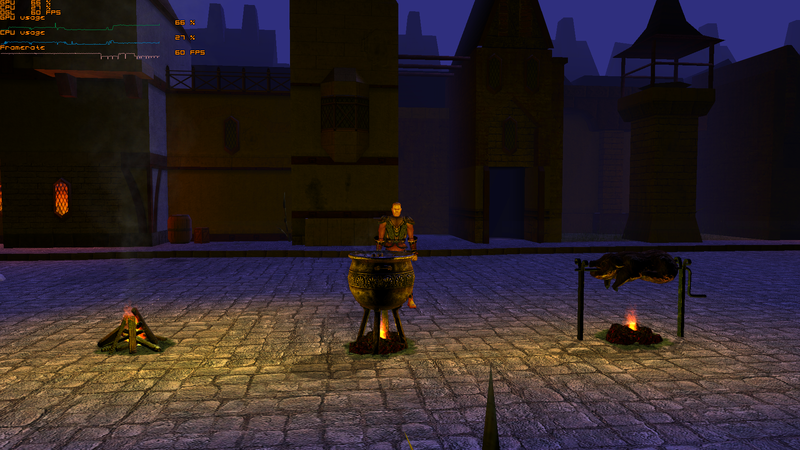 This is a alpha release of The Witcher 2 to Neverwinter Nights placeable porting project I am working on. 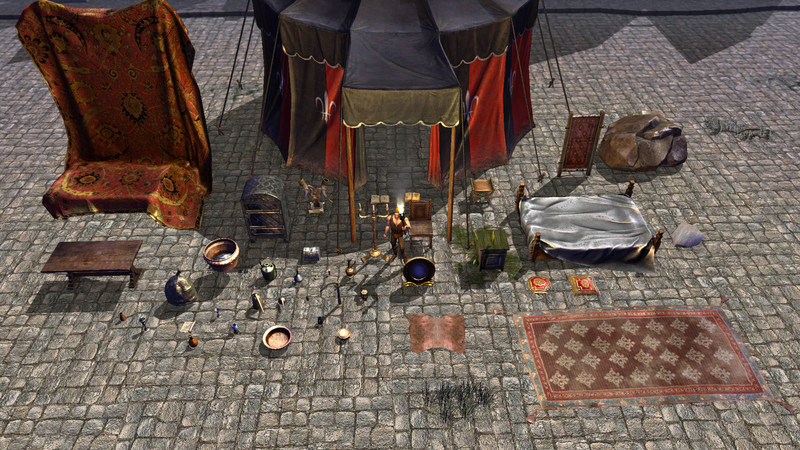 At this time it contains 53 placeables.All placeables have portraits,damage animations,destruction emitters and their orginal bit map,normal map and specular maps ported from The Witcher 2.These where specifically designed to add new content with normal and specular maps to Neverwinter Nights Enhanced Edition. These placeables are not in their final state,I would really like to get feedback from the community before I do a full release. ALPHA RELEASE 2 IS HERE! 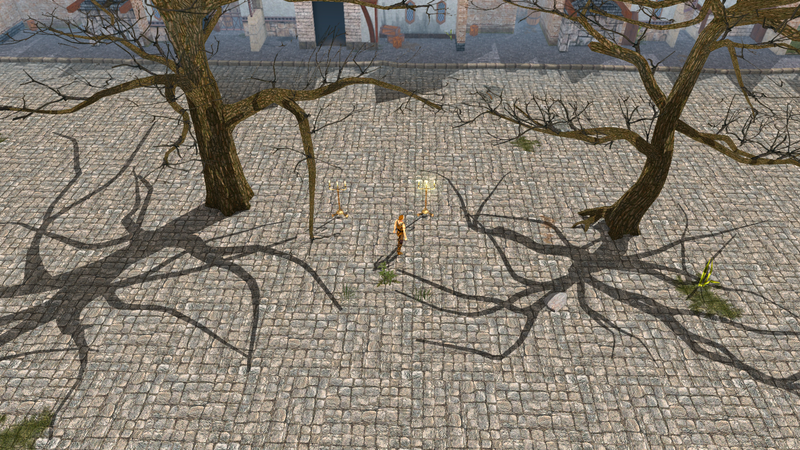 The plant and both grass models now have working dangly mesh so they will now blow in the wind and move when you walk by them. To see this effect on the new models, create a new area and go into area properties/visual/customize enviroment and turn up the weather-wind power. 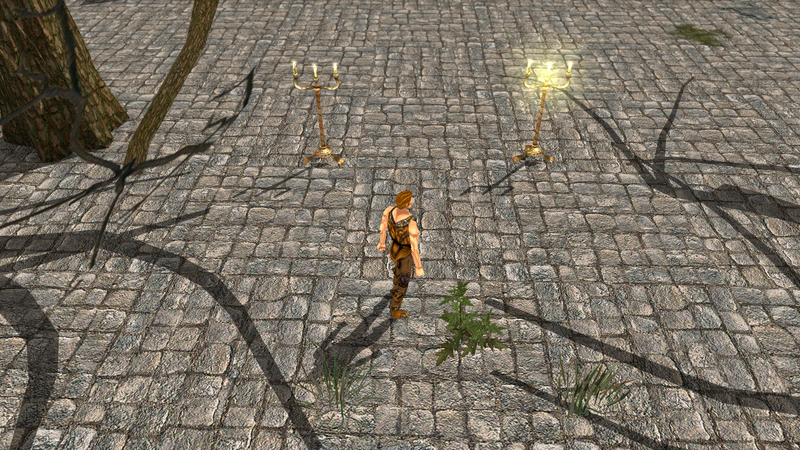 There are 2 versions of the candle stand now,one with a dynamic aurora light that will make dynamic shadows when you walk by and one without the aurora light. Both models emitters and blender lights will turn on/off with the nw_02_onoff script. To try this out, make a new placable with one of the candle stand appearences and in the placeable object properties/scripts assign the nw_02_onoff script to the OnClick slot and make sure the placeable is useable, then click OK. after the window closes try clicking the placeable it should turn on/off. The aurora light on the dynamic model will not turn off even if you destroy it so it is better set up as a static or non on/off placeable. These are the new fire models I have been working on. All 3 models have 2 versions, dynamic (with 2da light) and non dynamic (with animated blender point light). The lights on blender light versions are animated and have a weak flicker effect to them (you will probably only be able to see the animation effect at night).You can turn the emitters on and off with the default/on/off animations on both versions and you can turn the blender lights off/on on the non 2da versions. I made 5 new emitters for these models, 4 were made with textures from the witcher 2 and 1 I made with a picture I found on the internet that I modified in gimp. There are 2 smoke style emitters used as the steam coming off the cooking pot, 1 smoke style emtter used as the campfire smoke, 1 fire ember style emitter that throws sparks on all the fires and 1 fire emitter on all the fires that I made myself. Alpha release 3 comes with a extra Q_compatible 2da hak that will make it compatible with Project Q 2.2 and at the request of community members it also makes it compatible with More TNO placeables by Tiberius_Morguhn and Placeables From The Witcher 1 Game by Zwerkules. The optional hak only comes with the 2da's that make them all compatible, you will have to download Project Q, More TNO's and The witcher 1 haks seperately from their project pages. If you do use any or all of these haks, make sure you place the Q_compatible hak at the very top of all your haks in the toolset. I did ask CD PROJEKT RED for permission to port this content to Neverwinter Nights and to the Neverwinter Vault and CD PROJEKT RED did give me permission to do so. More information can be found in the link above. For those that do not know,this hak will not add to or change anything in the original campaigns,it is meant to be used in the toolset to add content to user created modules. First unzip and install the hak in your documents/neverwinter nights/hak folder.Open the toolset and creat a new module and a new area.Select Edit/module properties/custom content.In the drop down select the hak then click Add then click Ok.Select Wizards/placeable wizard then select the catagory you want your placeable blueprint to be in,name your new placeable and click the launch properties dialog box then click finish.In the placeable object properties select basic/appearance type and scroll through the appearance types to find the new models.All the models in this hak will start with (wit2) for example wit2_0001. I would like to thank the Neverwinter nights community for taking the time to write and make the guides and tutorials I have read and watched and for creating the tools needed to create custom content. I could not do this without you. Thank you to blackninja and everyone involved with Ninja Ripper. And a very special thanks to CD PROJEKT RED for allowing me to port content from The Witcher 2 to Neverwinter Nights. You may include this content in your compilations and use this content in any way you see fit in Neverwinter Nights as long as you are not making money off of it. I do not have the rights to give you permission to use this content in another game. You may post a link to this page on another site. If you are posting a module or PW that needs this hak on STEAM or any other site you may include this hak in the files pack or compilation as long as you post a link to this page in the description. You may not re-upload or copy paste THIS haks/mods content to any other site by itself for any reason, there is no NEED to do that. I guess this is meant for EE and not for the old diamond version? anyway I'm happy that some modder is bringing back a bit of life and "Modernity" with new objects-textures-polygons best in NWN. I did not know you could use a Mtr to make it work with both 1.69 and EE I will check it out and when i figure it out i will let you know something. . If you wanna quit Ninja Ripper, you can use The Witcher 3D models converter. Never tried it myself but it seems WAY easier than using Ninja Ripper! I've tried it and they look good... But as an advice, redo how the normal/spec maps where added. Use the new NWHak; move those lines to a .mtr file, compile the model and add them to the hak (.mtr, .mdl and .tga/dds). That way they will load faster, will support spec/normal and work on 1.69 too. Might be tiresome but is a huge change that will make your high poly models load in a breeze. Ok I will look into this. 2 big things going on with these are the size/scale some things are too big others are too small. And what looks like uv seams, but it is really shader seams. I forgot to remove doubles on the meshs after clearing the custom vertex data, so the places where they split the vertex still have double vertex. I will have to go into each mdl in neverblender and remove doubles. I will have this done for beta. I will download the witcher 2 converter and try it out. thank you dafena for showing me this. The witcher 2 (3) converter recommended by dafena works quiet well (tested Witcher 2). I tested a converstion into OBJ and imported that into Blender. A working base. BTW: That converter does also read Witcher 1 models, but in the version I tested, they looked messy = parts out of place. So I didn't do any further tests. Else: Nice job! A good addition, Id's say. They even seem to port that extrem fat bright coloring of the Witcher 2 game. Yup, I wanted to make a few Witcher 1 placeables and sadly they render with render/export with bad UV and couldn't find a way to scale it insanly so it would work fine. Just a word of caution on the grass model, each blade of grass is a mesh with 2 faces. so really it is made more for accenting something rather than replacing grass everywhere in a area. If you do just start to drop them everywhere in a area it will most likely start to get very heavy on performance and fps. most games will use what is called billboard textures for grass, bush's and leave's on trees.Which are just single 4 vertex plain's with a 2d texture applied to them that are then rendered by the gpu so that they always face the camera a certain way.To give an idea of how much more heavy it is,the grass model has 1,118 verts and 851 faces compare that to 4 verts and 2 faces on a billboard. most models that are made out of billboards will have a several billboards put together to make a model look real, but still. Disable shadows and compile it, that way you can place as many as you want without a huge impact on your perfomance. Be sure to weld them before making it double faced too. If they are two sided and use smoothing groups, don't weld them or everything gets really dark. Often you can just set all smoothing groups for such meshes to 0 and weld them. @Zwerkules: Again I learned something! Great. Another approach could be to assign smoothing group 1 to the one side and assign to the opposite side a different smoothing group. At least, that worked for me for the DLA-Railings, which are designed in a similar way. If they all have the same smoothing group, one would get these dark shadings Zwerkules mentioned. Looking forward to more work on this, as it seems like you're wanting to do? Thank you, yes I am still working on this project. All the updates and new info will be posted at the beamdog NWNEE forums, there is a the link in the description.this page will just get updated when I do new releases or add new files. Regarding permissions, is it OK to use this content in a module hak for NWN, then post the module and its hak on another site, with a caveat that it's not for use in other games? Otherwise it's pretty much unusable, since authors need to be free to publish on Steam, the Vault and elsewhere these days. I need to update the permissions. UPDATE: permissions updated. Need some pics and a bit more info for alpah 4. I will try to get that done soon.